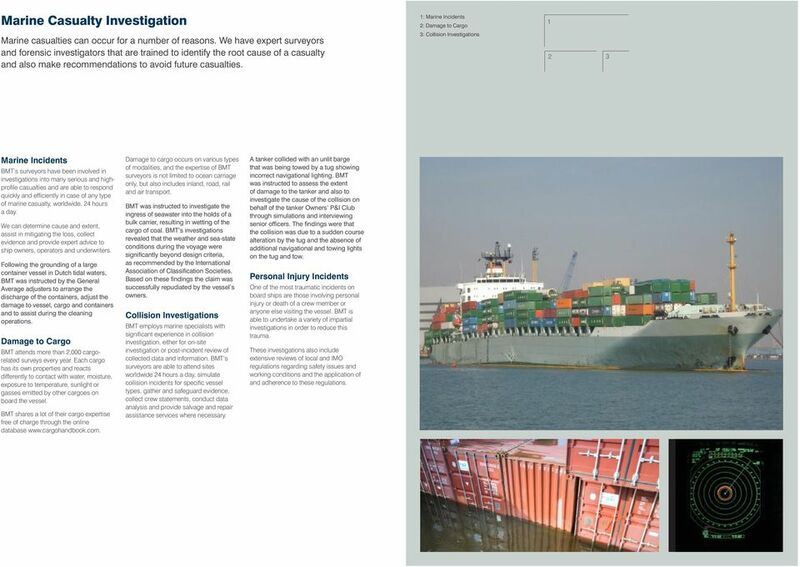 Download "Marine surveys Services and solutions"
3 Marine Casualty Investigation : Marine Incidents : Damage to Cargo Marine casualties can occur for a number of reasons. We have expert surveyors and forensic investigators that are trained to identify the root cause of a casualty and also make recommendations to avoid future casualties. : Collision Investigations Marine Incidents BMT s surveyors have been involved in investigations into many serious and highprofile casualties and are able to respond quickly and efficiently in case of any type of marine casualty, worldwide, 4 hours a day. We can determine cause and extent, assist in mitigating the loss, collect evidence and provide expert advice to ship owners, operators and underwriters. Following the grounding of a large container vessel in Dutch tidal waters, BMT was instructed by the General Average adjusters to arrange the discharge of the containers, adjust the damage to vessel, cargo and containers and to assist during the cleaning operations. Damage to Cargo BMT attends more than,000 cargorelated surveys every year. Each cargo has its own properties and reacts differently to contact with water, moisture, exposure to temperature, sunlight or gasses emitted by other cargoes on board the vessel. BMT shares a lot of their cargo expertise free of charge through the online database Damage to cargo occurs on various types of modalities, and the expertise of BMT surveyors is not limited to ocean carriage only, but also includes inland, road, rail and air transport. BMT was instructed to investigate the ingress of seawater into the holds of a bulk carrier, resulting in wetting of the cargo of coal. BMT s investigations revealed that the weather and sea-state conditions during the voyage were significantly beyond design criteria, as recommended by the International Association of Classification Societies. Based on these findings the claim was successfully repudiated by the vessel s owners. Collision Investigations BMT employs marine specialists with significant experience in collision investigation, either for on-site investigation or post-incident review of collected data and information. BMT s surveyors are able to attend sites worldwide 4 hours a day, simulate collision incidents for specific vessel types, gather and safeguard evidence, collect crew statements, conduct data analysis and provide salvage and repair assistance services where necessary. A tanker collided with an unlit barge that was being towed by a tug showing incorrect navigational lighting. BMT was instructed to assess the extent of damage to the tanker and also to investigate the cause of the collision on behalf of the tanker Owners P&I Club through simulations and interviewing senior officers. The findings were that the collision was due to a sudden course alteration by the tug and the absence of additional navigational and towing lights on the tug and tow. Personal Injury Incidents One of the most traumatic incidents on board ships are those involving personal injury or death of a crew member or anyone else visiting the vessel. BMT is able to undertake a variety of impartial investigations in order to reduce this trauma. These investigations also include extensive reviews of local and IMO regulations regarding safety issues and working conditions and the application of and adherence to these regulations. 4 Salvage Consultancy BMT offers specialist advice when assistance is required for different kinds of salvage and wreck removal operations. Our core salvage team includes experienced salvage masters and naval architects. Our surveyors are available worldwide, 4/7 for emergency response on-site, to provide advice on salvage and wreck removal, towage approvals, salvage tenders and to provide expert assistance in dispute and litigation. Shortly after departure from the docks a general cargo vessel beached north of IJmuiden. BMT was appointed on behalf of the vessel s Owners P&I Club and H&M underwriters to investigate the cause of the grounding and to assess the nature and extent of the damage sustained by the vessel. BMT was also asked to assess the damage possibly sustained by power lines of a nearby offshore wind farm and to assist with and supervise the salvage operation. Pollution and Damage to the Environment BMT is able to help through cause and extent investigation, data gathering and analysis, environmental assessments and surveys, risk assessment and reduction and permits and licensing. BMT was involved in a major oil spill investigation after a collision at the Port of Amsterdam. Several surveyors closely monitored the clean up operations, investigated the cause of the collision and assessed the damage to both vessels. 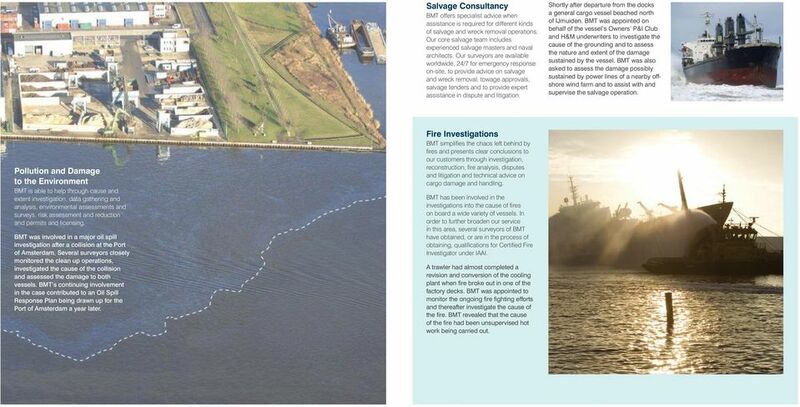 BMT s continuing involvement in the case contributed to an Oil Spill Response Plan being drawn up for the Port of Amsterdam a year later. Fire Investigations BMT simplifies the chaos left behind by fires and presents clear conclusions to our customers through investigation, reconstruction, fire analysis, disputes and litigation and technical advice on cargo damage and handling. BMT has been involved in the investigations into the cause of fires on board a wide variety of vessels. In order to further broaden our service in this area, several surveyors of BMT have obtained, or are in the process of obtaining, qualifications for Certified Fire Investigator under IAAI. A trawler had almost completed a revision and conversion of the cooling plant when fire broke out in one of the factory decks. BMT was appointed to monitor the ongoing fire fighting efforts and thereafter investigate the cause of the fire. BMT revealed that the cause of the fire had been unsupervised hot work being carried out. 5 H&M / Technical Surveys Our surveyors have experience in a broad range of disciplines. They can advise and conduct inspections into a number of areas to assist with insurance and damage claims and litigation. 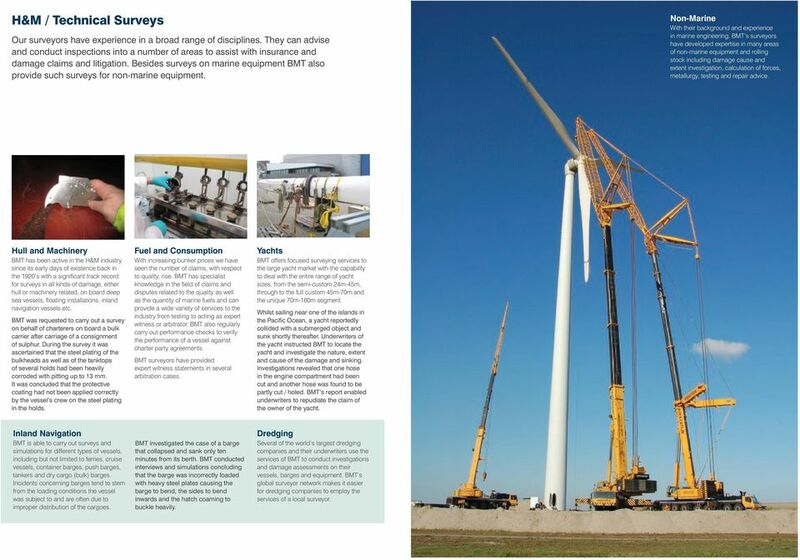 Besides surveys on marine equipment BMT also provide such surveys for non-marine equipment. 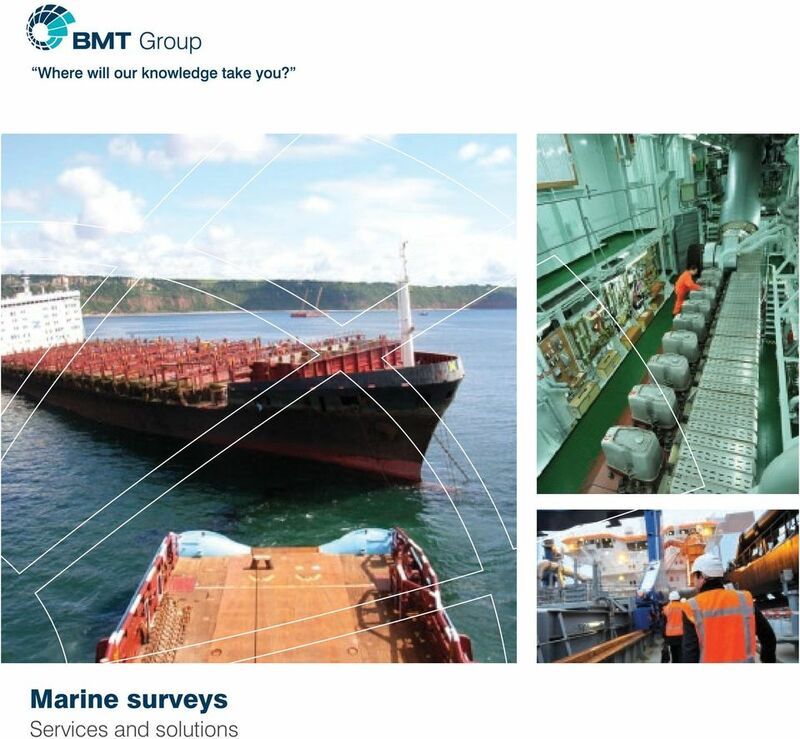 Non-Marine With their background and experience in marine engineering, BMT s surveyors have developed expertise in many areas of non-marine equipment and rolling stock including damage cause and extent investigation, calculation of forces, metallurgy, testing and repair advice. Hull and Machinery BMT has been active in the H&M industry since its early days of existence back in the 90 s with a significant track record for surveys in all kinds of damage, either hull or machinery related, on board deep sea vessels, floating installations, inland navigation vessels etc. BMT was requested to carry out a survey on behalf of charterers on board a bulk carrier after carriage of a consignment of sulphur. During the survey it was ascertained that the steel plating of the bulkheads as well as of the tanktops of several holds had been heavily corroded with pitting up to mm. It was concluded that the protective coating had not been applied correctly by the vessel s crew on the steel plating in the holds. Fuel and Consumption With increasing bunker prices we have seen the number of claims, with respect to quality, rise. 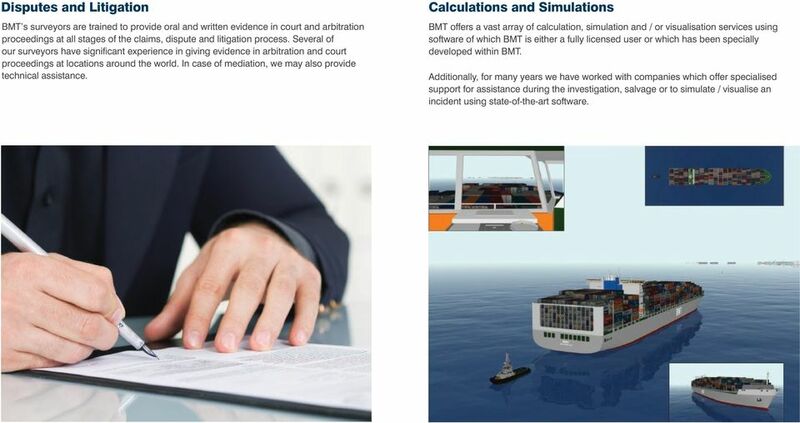 BMT has specialist knowledge in the field of claims and disputes related to the quality as well as the quantity of marine fuels and can provide a wide variety of services to the industry from testing to acting as expert witness or arbitrator. BMT also regularly carry out performance checks to verify the performance of a vessel against charter party agreements. BMT surveyors have provided expert witness statements in several arbitration cases. Yachts BMT offers focused surveying services to the large yacht market with the capability to deal with the entire range of yacht sizes, from the semi-custom 4m-45m, through to the full custom 45m-70m and the unique 70m-60m segment. Whilst sailing near one of the islands in the Pacific Ocean, a yacht reportedly collided with a submerged object and sunk shortly thereafter. Underwriters of the yacht instructed BMT to locate the yacht and investigate the nature, extent and cause of the damage and sinking. Investigations revealed that one hose in the engine compartment had been cut and another hose was found to be partly cut / holed. BMT s report enabled underwriters to repudiate the claim of the owner of the yacht. Inland Navigation BMT is able to carry out surveys and simulations for different types of vessels, including but not limited to ferries, cruise vessels, container barges, push barges, tankers and dry cargo (bulk) barges. Incidents concerning barges tend to stem from the loading conditions the vessel was subject to and are often due to improper distribution of the cargoes. BMT investigated the case of a barge that collapsed and sank only ten minutes from its berth. BMT conducted interviews and simulations concluding that the barge was incorrectly loaded with heavy steel plates causing the barge to bend, the sides to bend inwards and the hatch coaming to buckle heavily. Dredging Several of the world s largest dredging companies and their underwriters use the services of BMT to conduct investigations and damage assessments on their vessels, barges and equipment. 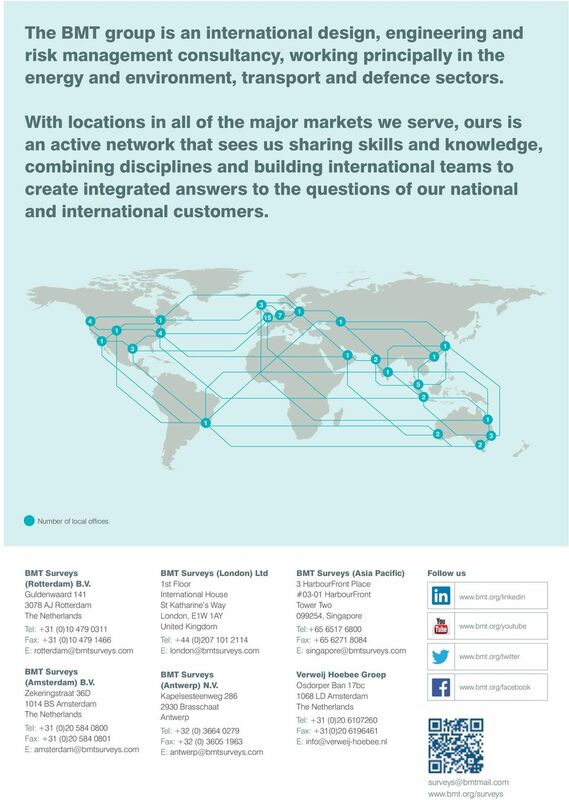 BMT s global surveyor network makes it easier for dredging companies to employ the services of a local surveyor. 6 Cargo Consultancy Each type of cargo has to be handled in a specific way and the closed nature of containers can conceal possible damage until arrival at the final destination. BMT is a world leader in providing advice and guidance for all types of cargo handling. BMT was requested by cargo underwriters to investigate and assist an insured in tackling a moisture and mould formation problem occurring during the containerised transit. Several key issues were identified and recommendations were drawn up by BMT. After implementation of these recommendations, the number of claims was significantly reduced and became almost nil. Calculations of Lashing and Securing Forces The stowage of containers, as well as for any other deck cargo, is very much based on complex calculations of forces for which the use of computers and lashing software is recommended. BMT has staff trained in this software who are able to calculate these forces. A large range of tests and simulations can be conducted on a laboratory scale, however the real test always occurs at sea. Testing can include the calculation of forces, testing of lashing equipment and containers, hydrodynamic modelling, market intelligence and trend analyses as well as expert witness and case reviews for lawyers and arbitration. Container Collapse BMT has extensive experience in the investigation of collapse of container stows and has an outstanding track record in forensic investigation and providing independent advice to ship owners, liner companies, P&I clubs or underwriters for loss-prevention and claim / litigation procedures. Dry Bulk Bulk carriers, or bulkers, are ships designed primarily for the transportation of solid bulk cargoes. These cargoes are generally uniform in composition and are loaded directly into the cargo space without any intermediate form of containment. 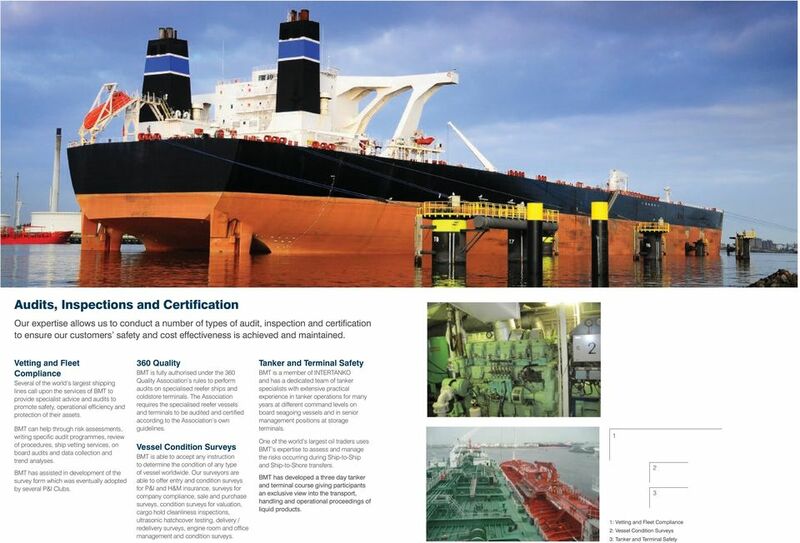 BMT can conduct ship inspections, risk assessments, investigations into the nature, extent and cause of damage, ultrasonic hatchcover testing, sampling and testing and provide advice on dry bulk transport and storage requirements and the liquefaction of cargoes. BMT was instructed by cargo underwriters to investigate a claim concerning a deviating smell on 49 containers with long grain rice which had been shipped on board two different vessels from South America to Europe. Our investigations have found a wide variety of causes, ranging from failing lashing systems to overloaded containers and improper stowage of containers on board the vessel. The investigations revealed that the rice had been loaded into the containers with too high moisture contents enabling the insured to claim the loss with the shippers. Through the intervention of BMT the claim was significantly reduced. Food and Perishables In the event of damage to perishable cargo BMT is able to conduct investigations into the nature, extent and cause of damage. BMT can also provide performance reviews of reefer containers and reefer vessels. Reefer data is analysed and a thorough nautical survey can be performed. For detailed advice on carriage of cargoes, please visit Heavy Lift and Project Cargo Heavy lift shipping is a very particular trade, often involving the sea transportation of extremely heavy and voluminous loads, requiring special care and preparation. 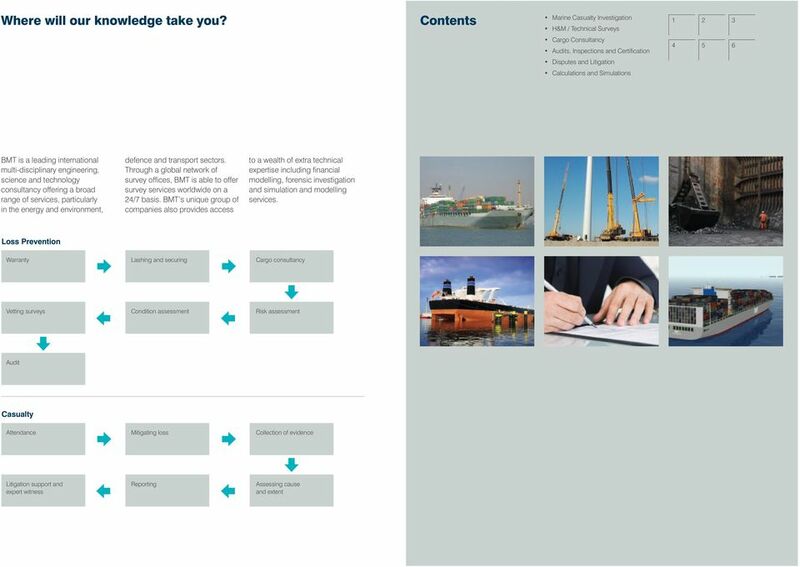 BMT can provide a number of services to increase the speed, efficiency and safety of these cargoes including inspections, calculation of forces and required lashings, strength calculations, towage approvals, route analyses and advice including weather and seastate forecasts and advice and supervision on stowage and seafastening. Oil, Gas and Chemicals The investigation of claims on liquid bulk cargo requires an analytical approach through the use of special laboratories for sampling and analysing and also checking the vast amount of records made by the crew during pre-loading and transportation. 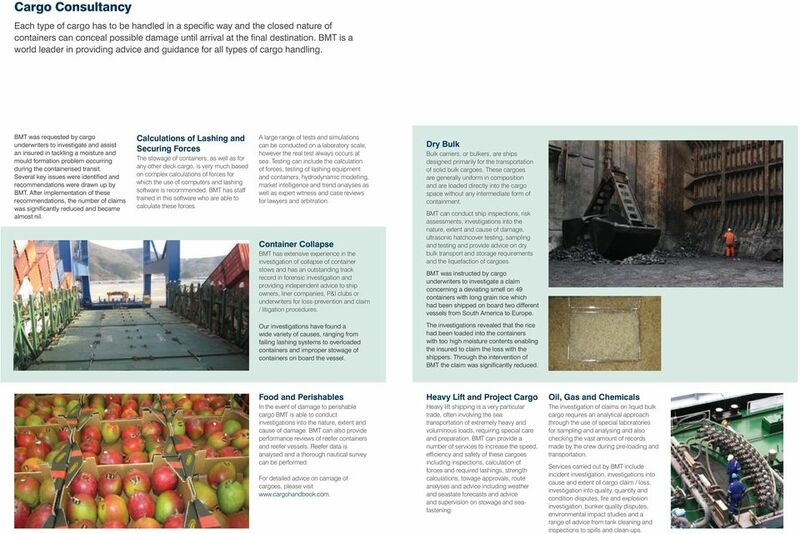 Services carried out by BMT include incident investigation, investigations into cause and extent of cargo claim / loss, investigation into quality, quantity and condition disputes, fire and explosion investigation, bunker quality disputes, environmental impact studies and a range of advice from tank cleaning and inspections to spills and clean-ups. 8 Disputes and Litigation BMT s surveyors are trained to provide oral and written evidence in court and arbitration proceedings at all stages of the claims, dispute and litigation process. Several of our surveyors have significant experience in giving evidence in arbitration and court proceedings at locations around the world. In case of mediation, we may also provide technical assistance. Calculations and Simulations BMT offers a vast array of calculation, simulation and / or visualisation services using software of which BMT is either a fully licensed user or which has been specially developed within BMT. Additionally, for many years we have worked with companies which offer specialised support for assistance during the investigation, salvage or to simulate / visualise an incident using state-of-the-art software. MARINE INSURANCE. F.O.R. (Free on Rail) This is same as F.O.B. but it concerns mainly the internal trade transactions. MARINE INSURANCE Introduction of the subject: Importance of Marine insurance in commerce; Marine insurance plays a very important role in the field of overseas commerce and internal trade of a country. CONTAINER SHIPMENT CYCLE AND RISKS. Captain LC Chan. Risk Management & Loss Prevention Consultant of CM Houlder Insurance Brokers Ltd.
Only available. at Pantaenius. Get a quote now! K.M. Dastur Reinsurance Brokers Pvt. Ltd.
Examiners will give higher marks where evidence of wider reading /deeper understanding is demonstrated. Appendix B Danish Shipping Academy The Commercial Shipping Program Maritime Law - Curriculum Vendor The course will be delivered as a joint venture between Gorissen Federspiel law firm and BIMCO education. A RISK ASSESSMENT METHODOLOGY AS A TOOL FOR SCREENING OF SHIP TO SHIP (STS) TRANSFER OPERATIONS.